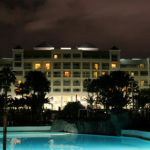 The Riu ClubHotel is a 4 star hotel in Maspalomas. If you are looking for an all-inclusive holiday, this hotel might be suitable, since the price includes all your food and drink. The meals are buffet-style so you can choose what you like, and the hotel sometimes has theme nights where the menu is concerned, such as Chinese night or Mexican night (although, strangely, not Canarian night). The food is good quality and the service is the same. As an all-inclusive hotel, this one always gets good reviews for the food and drink, since there is plenty of choice and the quality is good. Don’t miss the homemade pizza or delicious paella. If you pay a little more, you can get a sea/garden view. The sunsets are breathtaking. When you book you can choose a ‘standard’ room or a ‘spacious garden view’ room and the second option gives you a slightly larger room too. The standard rooms are cosy but without much room for suitcases etc. The location is great, since Maspalomas beach is beautiful and you’re right on the beach if you stay at the Riu ClubHotel. Some people complain that the pools are not heated and although this is refreshing in the summer and most kids don’t seem to mind at any time, it isn’t much fun in the cooler months. The entertainment is basic, according to some tourists, and good according to others. Also, the wifi is only available in the reception area (and you have to pay for that). Perhaps a 4 star hotel should offer complimentary wifi.